The Goff’s Clean Guard doors offer a premium, wash down ready, high performance door. This door comes standard with many premium features that are required for facilities that wash down the area around the door and must wash down the door on a regular basis. 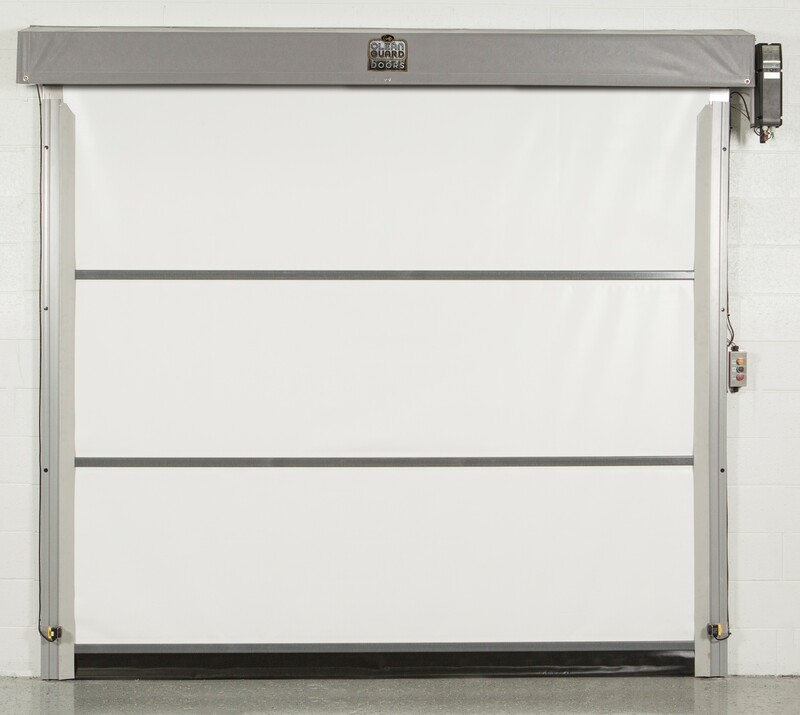 The door is designed to be a very durable door that will not rust, corrode or deteriorate in these conditions. It is priced very competitively compared to other doors with the same features and major upgrades. Pre-assembled components and simple door design – reduces installation time. Adjustable projection mount hardware to provide maximum flexibility for many installation scenarios. Door panels meet NFPA-701 and CSFM flame resistance standards. Door panels meet NFPA 701 and California Fire marshal standards flame resistance standards. Door panels are chemical resistant. IP-65 rated, wash down door. Quick installation with only 4 components. VFD provides soft start / stop (42″/sec only). 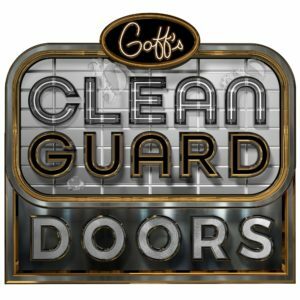 Goff’s Enterprises, Inc warrants all Clean Guard doors for 3 years. This includes all component parts including the motor and field labor. Goff’s reserves the right to repair or replace warranty items at its discretion. Toggle Switch is standard on all G1 powered doors. Transmitter and a receiver. Perfect for use with Fork Lift/Vehicle Drivers. Mounts to the ceiling. Perfect for Pedestrians & Fork Lift/Vehicle Drivers. Optional safety photo eye is available on powered doors. Automatically detect pedestrian and vehicle motion within a certain range of the detector. Mounts directly to the wall at the door opening. Projects around an existing door. Offered in 115 volt, single phase (40 cycles per hour) or 208 volt 3 phase (120 cycles per hour). Offered in 115 volt or 230 volt, single phase (120 cycles per hour) and 230 volt or 480 volt 3 phase (120 cycles per hour). *The color options shown are not an exact match. For samples of the material please contact Goff’s.